Fig. 189 Transmission mechanism. 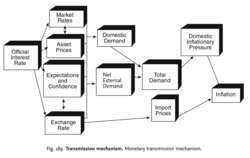 Monetary transmission mechanism. the process whereby a particular policy instrument (e.g INTEREST RATE) ‘works’ its way through the economic system to affect a designated policy target (e.g. the rate of INFLATION). The linkages between an instrument and target can be lengthy and complicated. By way of illustration, Fig. 189 depicts a simplified version of the Bank of England model (the full model has some 150 linkages!) that the Bank's MONETARY POLICY COMMITTEE (MPC) uses to track the impact of interest rate changes on the government's inflation target (currently an annualized inflation rate of no more than 2%). The process begins when the MPC ‘announces’, for example, an increase in the ‘official’ rate of interest with the objective of reducing inflationary pressures in the economy. To enforce this rate rise in the money markets, the Bank must move to reduce the money supply (see MONETARY POLICY COMMITTEE for further details). These monetary changes can be expected to impact on the ‘real’ economy in various ways. Monetarists posit that the reduction in the money supply will directly reduce the CONSUMPTION component of AGGREGATE DEMAND and that this will be reinforced by higher interest rates causing a fall in the demand for CREDIT (bank loans and mortgages) to finance consumption and house and other asset purchases. Keynesians also emphasize the impact of an increase in the cost of capital, as interest rates rise, in reducing the amount of INVESTMENT expenditure undertaken by businesses. (For further discussion see MONEY SUPPLY/SPENDING LINKAGES.) The combination of these factors can be expected to dampen down spending in the economy and thus reduce any tendency for demand to outstrip the supply potential of the economy (see DEMAND-PULL INFLATION). Furthermore, monetarists posit that under a FLOATING EXCHANGE-RATE system, a reduction in the money supply will reduce the amount of pounds offered in exchange for foreign currencies, thus causing the exchange rate to appreciate. This has the effect of reducing import prices, again exerting downward pressure on the general price level. because of‘leads and lags’ in the introduction and implementation and the length of time it takes for the effects of a particular instrument change to work its way through the economy, various ‘distortions’ may occur that undermine the effectiveness of the policy initiative. For further discussion see DEMAND MANAGEMENT. See QUANTITY THEORY OF MONEY. To achieve its objectives, the Bank tries to minimize the unnecessary volatility in the short-term rates by using its monetary policy instruments as excessive volatility in overnight repo rate may be transmitted along the yield curve and could impair the process of monetary transmission mechanism. Section 3 introduces the proposed methodology and the key technologies for multilink transmission mechanism design. Based on the theoretical findings on the interest rate transmission mechanism and when neglecting mutual interactions among transmission channels, the relationships between variables can be simply described as follows: a sudden monetary tightening in the form of an increase in the key interest rate is transmitted to short-term interest rates and also to evolution of exchange rate. Preliminary work on this topic was done by Milton Friedman (1972) who presented a revised version of his prior work on lags in effect of monetary policy and concluded that the transmission mechanism of monetary policy occured after certain long and variable lags. The monetary policy transmission mechanism is comprised by a series of five channels, each governing a specific cause-effect structure: the expectations channel, the interest rate channel, the asset price channel, the credit channel and the exchange rate channel. At the same time, the CBR took additional steps to address the flaws in the transmission mechanism, by narrowing the spread on 3m to 12m CBR refinancing instruments. Besides strengthening the monetary policy transmission mechanism, we read this move as preparation for future cuts in the key rate whilst preventing the deposit facility from falling to zero. Ultimately, we think the ECB will have to purchase private-sector assets in order to fix the transmission mechanism," said Andrew Bosomworth at PIMCO, the world's largest bond fund. A rate cut without additional efforts to repair the transmission mechanism would quickly go up in smoke and could even be regarded as an act of desperation," Brzeski said. Therefore, VAR models were widely been used in the analysis of monetary transmission mechanism (MTM) (as, for example, Bagliano and Favero, 1998; Christiano, Eichenbaum and Evans, 1999; Mojon and Peersman 2001; Peersman and Smets, 2001; Rebucci and Ciccarelli, 2002). The lack of monetary policy flexibility is also a rating constraint for the GCC, particularly in terms of exchange rate regimes, the credibility of monetary policy, and the effectiveness of the transmission mechanism via the financial system and capital markets. In manufacturing and process equipment, motors are rarely used in isolation; as a minimum there will also be a gearbox and some form of transmission mechanism, both of which will consume energy.